Sydney is famous for its beaches, and with good reason. Sparkling white sands,crystalclearwaters and enchanting coves are in abundance – the hardest part is deciding where to go first. Whether you’re into sunbathing, snorkelling, solitude or celebrity spotting, we’ve got you covered. Read on for our guide to exploring some of Sydney’s best beaches. 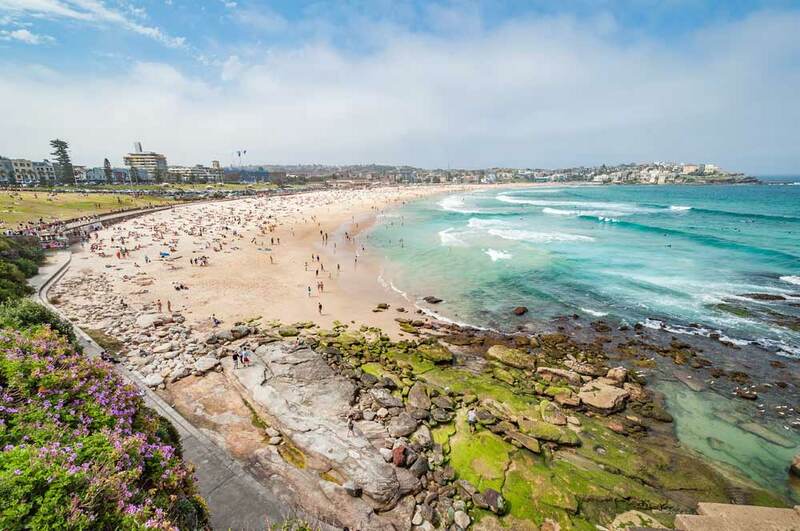 Bondi Beach, located a short 7km drive from the Sydney CBD is arguably Australia’s best known beach and a hot spot for celebrities and tourists alike. Get there early to stake your spot on the sand, or sit back and enjoy a spot of people-watching from a local bar or cafe. Those who find Bondi a little too confronting will love the picturesque Bronte Beach, a short walk from its more famous sister beach. Boasting stunning views, a large rock pool, surfing waves and plenty of grassy picnic spots, it’s hard to beat this gem. A short ferry ride from Circular Quay will carry you to trendy Manly. The gateway to Sydney’s northern beaches, Manly is a great destination in its own right. Snorkelers will love Shelly Beach, while sunbathers and swimmers will find much to enjoy along the main harbour-side beach strip. Tucked away in one of Manly’s many hidden coves and surrounded by a dense thicket of bush, Collins Flat Beach feels like it has been caught in a time loop. If it weren’t for the boats docked in its emerald waters you’d be forgiven for thinking you were the first person to explore this pristine coastline. Take a picnic and settle in for a relaxing afternoon. Otherwise known as Summer Bay, television fans will enjoy the pilgrimage to iconic Palm Beach, made famous by Aussie soap Home and Away. Allow a couple of hours for the drive from Sydney – you’ll want to stop and admire the scenery on the way. Just south of Palm Beach you’ll find Whale Beach. It’s a popular spot for surfers, who flock there in droves to ride the waves that form along its surf break, known as the Wedge. The lifeguards patrolling the shore make it a safe spot for family swimming, and the local surf club puts on a great weekend lunch. Located in Sydney’s north, near the suburb of Mosman, Balmoral is a favourite among locals. Enjoy a leisurely swim, hire a paddle board if you’re feeling adventurous or stop for a bite at one of the local cafes. If you’re looking to make a day of it, Taronga Zoo is just a short five-minute drive away.